I like creating this blog. Somedays I think I have nothing to say but then a thought or idea pops into my head and I’m away. Another thing I enjoy is getting feedback. And over the years I’ve really started to embraced those that challenge what I say. It’s kinda boring if everyone praises everything you’ve gotta say. Because if there’s no challenge there’s not a lot of learning. We get stale. So when people question my thoughts I get a buzz out of it. It forces me to improve and hone the message. Here’s the thought for today. The challenge has to go both ways. I think I’ve been too nice and I need to challenge you guys a bit more. Heres a comment that triggered this. what would you say to be are the keys things to show that you have achieved a good ball position? It seems like an honest question but I think it’s off the mark. I take responsibility. Maybe I’m not being clear enough with my words. Maybe there’s still some doubt about how to successfully apply the automatic golf principles. Try this on for size. It’s not what I think is important or what a golf pro thinks is ideal that’s of any concern to you. The vitally important part of what I’m on about is YOU. It’s up to you to break free from the restrictive attitude of traditional golf. You need to stop waiting for me (or anyone else) to tell you what’s right or wrong. If you’re waiting for permission to start playing golf then now is the time. If you’re waiting for the perfect golf swing instruction to fall in your lap then I’m sorry, you’ll be waiting for a long time. My strongest recommendation is to apply the principles that are mentioned around here, and then get outside and hit the ball. You need to add your own flavor, of this I’m sure. Nobody can tell you how to grip, stand and swing. All instruction is a guide and you have to be brave enough to trust your own learning system. It’s scary to forget about all others and play how you really want. But it’s the only way to make significant progress with your game. 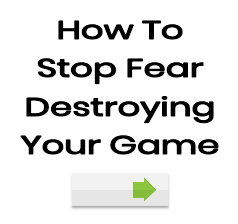 It’s the only way to break the shackles and take your game to a level that will surprise you. It’s what I call remarkable golf. Most golf coaches have failed you because they haven’t taught you to be you. They’re so preoccupied with getting you to conform to the status quo that they have forgotten that golf is played by individuals. Do you think they have ever set out to achieve their ideal technique or do you think their technique found them? No. They grab their clubs and go create. They play the game and in the process their unique swing finds them. And please don’t confuse “play” with just keeping score. That’s not what i mean when I say “play”. But why are so many golf coaches trying to get us to conform? It’s arse about. Sidenote: The “playing” mentality is definitely present when these champions are on the way up but goes missing sometimes when they too get sidetracked by too much instruction. How do I get this ball over that tree? Is there an easier way to get this ball to that target? Can I use my 4 iron to play this chip shot? What will happen when I try (insert idea here)? Is the ball position correct? None of this stuff is important because playing/exploring/creating gives you YOUR best swing. This is what automatic golf is all about. It’s less about the coach and more about you – giving you the freedom, courage and trust to play golf in a way that suits you. The coach is a mentor. We’re here to guide and challenge but there really is no way any coach can tell you exactly how to swing the club. Traditional teaching is the least efficient way of getting a result. When the student is waiting for the coach to impart his wisdom and the coach responds, there is very little chance of magic. Remarkable is not going to happen. When you’re told to adjust your grip/stance/swing to match a perceived ideal you’re only at the bottom of the golf improvement cycle. You have so much more gas in the tank. This is why we all feel we’re not even close to our golfing potential. Stop relying on others to tell you what to do. Man up. Take a deep breath and stroll onto the links and let your swing find you. There’s no right and wrong here and please don’t let the odd mistake stifle your learning. Mistakes are part of the process and a sign you’re on track. Too many golfers have been subdued by the fear of a bad shot or off swing. I get excited when a golfer writes me and says. Cameron, I’ve read your stuff and went out and played today with great results. I threw the rule book away and left the ego in the car. I aimed left (because that feels awesome) and swung with the freedom of a teenager. The ball took off to the left and drifted back in play. I wasn’t worried about what I was doing and the more I relaxed and swung the better I played. Thank you. I can’t hit my long irons. What am I doing wrong? I feel like I’ve failed. This is traditional thinking and leads to a boring and unsatisfying career. One more time: Automatic golf is not about me (or anyone else) imparting the correct golf swing wisdom. It’s about giving you the permission (and hopefully courage) to believe enough in yourself to let your swing and game find you. If you want to get more on this then please check out my Simple Golf Improvement System. It gives you enough information to set you on the right path, but doesn’t overload or stifle your individualism. I find occasionally I slip into the old system (not as often) but then simply remind myself of the path I am now following and yes it does require courage because fear can be a real factor.Sorry on this post Cam you are right and I can’t find anything to challenge. One thing ive always noted would be the golfers determination to get things done “right”. after they get into this minset of having to do everything perfectly its very difficult to switch to a more”learning” type system instead of deciding that everything will happen all at once. I was never like this thanfully so i learned quickly. I still have absolutely no distance with any of my clubs but at least i can score below 100. I feel that after playing automatically for three and one half years i would be able to hit the ball at least 270 and score below 80. Apparently not. This is why im not worried about improving because i never will. Ive done everything youve said cameron over three years now and i still cant break 100. I dont feel that im doing anything wrong so i might as well just continue to hack my way through. I guess auto golf doesnt work for everyone. And by the way i only hit my seven iron about 120. pretty pathetic after three years.